What if it were possible to live two very different lives in two separate worlds? What if the dreams we awaken from are the fading memories of that second life? What if one day we woke up in the wrong world? Every night, a woman on a black warhorse gallops through the mist in Chris Redston’s dreams. Every night, she begs him not to come to her. Every night, she aims her rifle at his head and fires. The last thing Chris expects—or wants—is for this nightmare to be real. But when he wakes up in the world of his dreams, he has to choose between the likelihood that he’s gone spectacularly bonkers or the possibility that he’s just been let in on the secret of the ages. Dreamlander is a fantasy story, but it reads like a thriller. It is a rip roaring adventure and one of the best novels I have read in a long time. 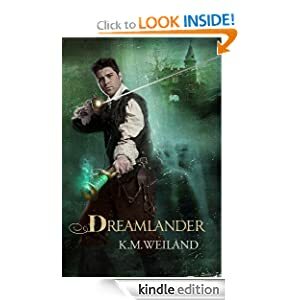 Dreamlander excels as a work of fantasy. Imagine you are plagued by a relentless recurring dream. At the end of the dream, you are warned to stay away and are shot in the head. At that instant you waken from this horrifying nightmare. Now imagine the world as we know it is only part of a parallel universe and your dreams are not simply dreams but a portal to another universe. Such is the premise of Dreamlander. Chris Redston, the protagonist, lives in Chicago where he works as a journalist in the world we know. It is set in our time. When he learns that dreams are real and he has a special role in the other world, the stage is set for a fascinating journey. His conscious life becomes a seemingly endless state of wakefulness alternately waking in one world or the other. He learns the princess of his dreams is the guardian of the Gifted and he is the Gifted. Readers might draw parallels to The Chronicles of Narnia by C.S. Lewis, yet Dreamlander is original, unique and deserves a place of its own in this genre. Follow Chris as he is caught up in a world of intrigue, treachery and war at home and in Lael, his place in the other world. Dreamlander brings a diverse cast of realistic protagonists fighting for survival against seemingly overwhelming odds. Weiland’s world building features well crafted, warring kingdoms, and alliances that do battle for the loyalty of their residents. A map helps guide readers as they try to visualize the wonders of this magical kingdom. In Lael battles are fought with swords, daggers and a steam powered gun. Combatants ride warhorses. Citizens travel between cities via tram like cars. Chris must learn sword craft, and how to fight on horseback under supervision of the protector of the princess who is his guardian. In Lael Chris even enjoys a reunion with his parents and siblings but from an earlier time. Dreamlander is anything but predictable. Loyalties shift. As in war, the pendulum shifts between the defenders and would be conquerors. Tension builds toward a frantic climax. Add to this, an imbalance in the universe that portends the end of both worlds and you have the makings of an original example of high fiction. I found myself flying through the pages at a frantic pace. Dreamlander is that good. K.M. 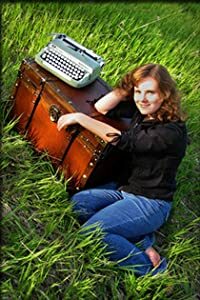 Weiland writes historical and speculative fiction and mentors other writers through her website, editing services, workshops, books, CDs, and blogs. Stories are like breathing. Life without a story in my head is one-dimensional, stagnant, vapid. I love the life God has given me, but I think I love it better because I’m able to live out so many other lives on the page. I’m more content to be who I am because I’m not trapped in that identity. When I sit down at my computer and put my fingers on the keys, I can be anyone or anything, at any time in history. I write because it’s freedom. I set aside two hours, five days a week, to write, usually between four and six p.m. I’m a firm believer in Peter de Vries claim: “I write when I’m inspired, and I see to it that I’m inspired at nine o’clock every morning.” I spend the first half hour scribbling ideas in a writing journal, reviewing character sketches and research notes, reading an article on the craft, and proofreading what I wrote the day before. Then I pick a soundtrack, say a prayer for guidance, and dive in. It takes years sometimes for my ideas to find their way onto the page. After the first kernel of inspiration takes root, I play with it and play with it, discovering characters and scenes and plot twists. Finally, when I think it’s ready, I dig out a notebook and start sketching ideas and outlines. Depending on the subject matter, I spend a few months researching, then take a deep breath and pray that all the work will pay off in a way that will glorify God. Most of my story ideas begin with a character and a place. An outlaw in the Wyoming Territory. A mercenary knight in the Crusades. A vigilante plantation owner in Kenya. A female spy in the Napoleonic Wars. A barnstormer in early 20th-century Kansas. After that, who knows? Inspiration is a gift from God: bits and pieces, tiny ideas that bloom into unexpected treasures. Writing is both a gift and an art. As a gift, it must be approached with humility: the writer is only the vessel through which inspiration flows. As an art, it must be approached with passion and discipline: a gift that’s never developed wasn’t worth the giving.